Thematic maps, more formally known as choropleth maps, are great for conveying information about differences between areas. Using shaded and/or patterned polygons makes it easier to visualise geographic distribution of specific attributes. But picking colours to show those differences can be a problem – the bigger the more classes the data is divided into. Colours are especially important when you work with orderable, numerical data and want to pinpoint hostpots (either concentration or deficiency) of certain characteristics. Coming up with 4-colour scheme is easy, 6 is a stretch but 10 is a real challenge! For clarity of information, it is best to avoid more than 5 classes because with more classes the difference in shades becomes too subtle for a human eye to easily distinguish a “hierarchy”. It is especially the case when using thematic overlay in combination with a multi-colour background (eg. as a transparent overlay on Google Map). Dividing the data into meaningful classes is a science on its own and I will come back to it in a separate post. Today I just wanted to focus on colour selection and to introduce a free online tool that will help in choosing the right combination. 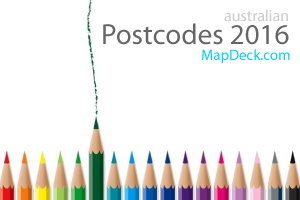 The most commonly used colours for thematic mapping are red, blue, green, and purple, with white, yellow or grey as a secondary, “lighter” colours in the mix. 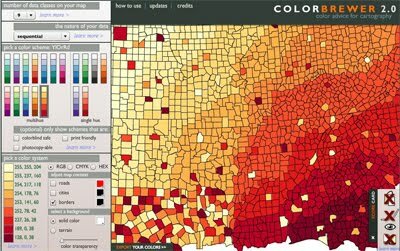 “ColorBrewer 2.0” is a great colour selection tool that allows to experiment with the most popular colour swatches in various combinations. It caters for 3 different data types: qualitative, sequential and diverging, and depending on the option, allows to specify up to 12 colour classes (as RGB, CMYK or HEX values). An interactive “map panel” allows previewing your selection with different transparency settings and background colours. ScoreCard feature provides a guide to useability aspect of the selected combination - in terms of potential issues for colour blind, B&W photocopying, colour-printing and/or displaying on LCD monitors. 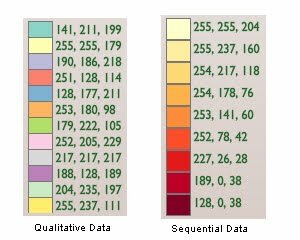 To present “nominal/ qualitative data” which is un-orderable, non-numerical, the colour variation should not present a pattern and should be totally random. ColorBrewer allows do define up to 12 classes. To present “sequential data”, like for example counts by certain characteristics, it is best to use shades of a single colour. ColorBrewer allows do define up to 9 classes. If you are desperate for 10 class scheme, use YlorRD variant with white as 10th class. For “diverging data”, that is data that oscillates around a certain “standardised value” (like mean or median), it is best to use 2 diverging colours with a neutral midrange shade. Again, ColorBrewer goes only to 9 classes but if you require 10 classes, it is easy to combine 6 class contrasting colours from sequential option (just ignore the first lightest class and merge remaining 5 shades from each colour scheme for your customised 10 colour swatch). Normally I use a gradual scale rather than group into a number of discrete colours. My default scale is red-yellow-green-cyan-blue, because that allows values close to each other all the way along the scale to be distinguished. Thanks for your comment Eric. I am still experimenting to find what works best with different backgrounds (ie. 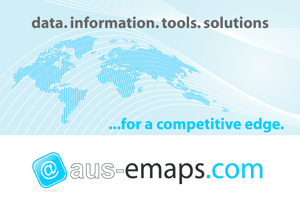 maps, satellite overlays). I guess, rainbow approach may be good if you really need many classes. Same Eric i am using gradual scale out of group.